Leo Cullen has backed Robbie Henshaw and Devin Toner to prove their fitness in tomorrow’s PRO14 clash against Glasgow ahead of next weekend’s Champions Cup semi-final showdown with Toulouse. The international pair return from respective lengthy spells out with Henshaw (leg) and Toner (ankle) not having played since Ireland’s Six Nations defeat to England back in February. 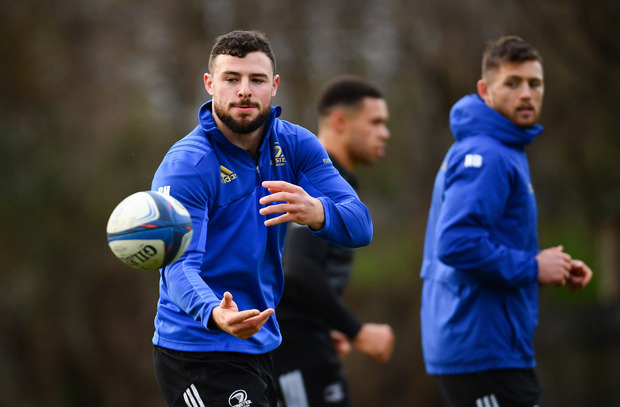 Both players have now got two weeks of training under their belts and with a chance to get some valuable game time at the RDS, Cullen believes it will be sufficient time for Henshaw and Toner to ensure that they are involved in the clash with Toulouse. “They got through all last week as well, which was important,” Cullen said this afternoon at the MS Ireland Care Centre in Dublin. “It’s not like they’re just getting dropped back in for this game in a rushed manner. “They got through all last week, did the match-day warm-up last week, and we’ve tried to set them up well so they can come back in and do well. “Robbie gives us a great physical presence in the midfield of the field on both sides of the ball. “He’s growing all the time in terms of his distribution and his ability to ball play as well. The fact he has played 15 in the Six Nations just adds another dimension to his game. “Dev has a tonne of experience and the presence he brings. It’s more just his calmness in terms of how he leads the forwards in various aspects of the game. Sean O’Brien will captain the team and with the Tullow native nearing the end of his time with Leinster ahead of his move to London Irish, he admitted that he was conscious of the fact that his time left in the blue jersey is limited. “I’d be lying if I said I didn’t think about so it is a little bit more special,” O’Brien maintained. “Firstly to lead out the lads, and secondly that it could be potentially my last game in the RDS – it’s one I’m really looking forward to and should be a cracker of a game. “I’ve been at peace with it (move) now for a while. There are seven or eight weeks left in the season and that’s what I’m focusing on now and not really thinking about much else. “That’s the exciting part of being in this group, we’re in the business end of the season and a lot of exciting games coming up. That’s at the forefront of my mind. “You think about the group and how you can add as much value as you can and make sure you’re preparing them as best as possible regardless of whether you’re in the team or not.